Home → General → Employment Trends Show Improvement to the Number of Available Jobs in Lansing, Michigan. Are you pursuing a new job in Lansing, Michigan, area? 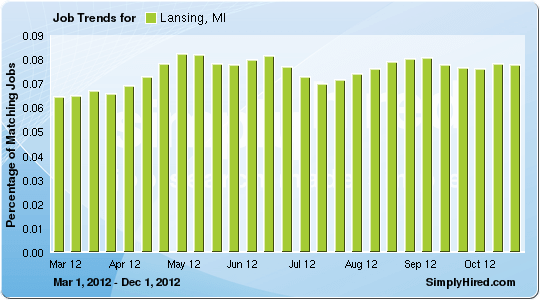 According to recent employment trends the number of available jobs in Lansing, Michigan, has increased by over 15%. If you’re in the market for a new job, it will be important to fine-tune your resume and cover letter for each application. Make sure to read the entire job description and invest the extra time to make strategic adjustments to your resume. You may also want to create a metric driven action-plan, so you can adapt your search and learn from mistakes. If you find yourself in the job market, you owe it to yourself to seek professional guidance. It’s not always the most qualified candidate chosen for the job – it’s the most prepared. Vertical Media Solutions has the experience to guide you through the employment process, so give us a call today: 616-631-4300 or 517-308-0800.